When on a cruise vacation in the Caribbean, there's a chance your ship will call in San Juan, Puerto Rico. We've put together 15 things to do at the popular travel destination. Step into medieval times and embrace 500 years of history when you visit the popular cruise port of San Juan, Puerto Rico. Located on the northeastern coast of Puerto Rico, this town is the perfect getaway for the history buff, the sun seeker, the foodie, and the adventurer. San Juan is the capital of Puerto Rico and is also one of the most popular home-based cruise ports in the Caribbean. Royal Caribbean, Carnival Cruise Line, and Celebrity Cruises are just some of the cruise lines that use San Juan as a home port, and many other lines visit the city as a port of call during different itineraries. Either way, you are guaranteed to have fun in this beautiful place. San Juan is a major historical destination, famous for its huge city walls and forts that made it one of the most formidable ports back in the 16th to 18th centuries. In addition to history, this port also features the usual Caribbean charms, like beautiful beaches, tropical rainforests, and friendly locals. As a result, there is plenty to see and do on your port day at this amazing place. We picked the top 15 things to do in San Juan, Puerto Rico to help you prepare for an unforgettable visit. 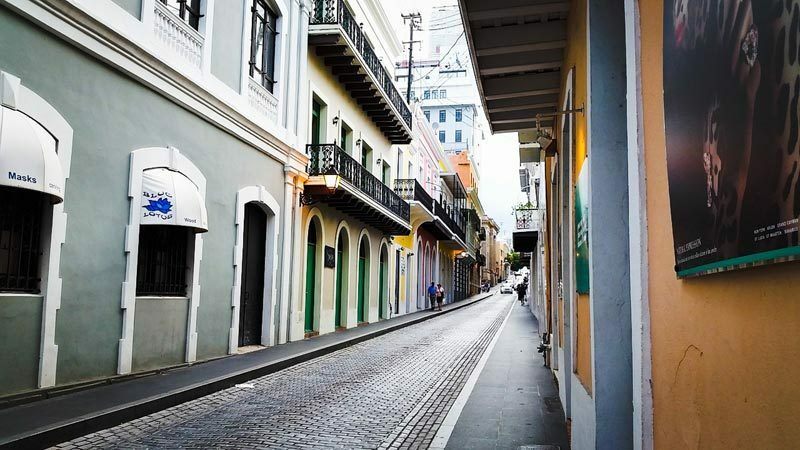 One of the most notable places in San Juan is Old San Juan town. It’s an islet that connects to mainland San Juan via three bridges and a causeway. You are likely to dock at this town as it features one of the largest piers in Puerto Rico. Cruise ships visiting the town as a port of call typically dock at this pier. A second pier named the Pan American pier is found on the other side of the islet. It is used for cruises that embark from this destination. Old San Juan features most of the nation’s historical monuments on its west end. The site of the monuments was named a national historic site by UNESCO and is a must-visit for anyone interested in the rich and colorful history of the Caribbean. Everything you need for your cruise vacation can be found here. This old Spanish colonial town features gorgeous pastel-colored colonial townhouses, old buildings, and forts that date back to the 1500s. Points of interest include Fort San Felipe Del Morro, Fort San Cristobal, and La Fortaleza. Enjoy the convenience of exploring the town found right across the street from the cruise pier and experience the vibrant energy of OSJ as you walk down its narrow cobblestone paths lined with postcard-perfect colorful townhouses. Go shopping downtown, enjoy popular Puerto Rican dishes, or visit the historical sites. Visit the western end of OSJ to explore the magnificent forts found in the National Historic Site. From the cruise ship terminal, head to the left and walk along the picturesque Paseo de la Princesa walkway. This walkway will take you past the Roots Fountain and along the old city walls up to the National Historical Park, where you will find the famous Castillo San Felipe Del Morro fortress. This site charges a $5 admittance fee for all people above the age of 15 years. It opens at 9.00 a.m. and closes at 6.00 p.m.
One of the most popular places to visit in San Juan is the Castillo San Felipe Del Morro fortress, commonly referred to as El Morro. It is a huge, multi-layered fort that was built in 1539. It served to protect the Spanish colony and thwarted several attacks from the Dutch, the British, and even the Americans at various times in the island’s history. The fort has beautiful grounds which used to be the military’s marching grounds when the fort was in active service. The grounds are now used by the locals and tourists alike for flying kites, weddings, picnics, and photography. Explore the mysteries of the fort and climb to the highest watch towers for the advantageous views of San Juan Bay. Another point of interest in Old San Juan town is Fort San Cristobal. This fort was built in the 1700s to protect El Morro from a land-based attack after such an attempt nearly succeeded. Visit this beautiful site and explore the exhibit of the military quarters, the kitchen, the mysterious tunnels, gun outlets, and Garitas. If your cruise ship is in port till late in the evening, don’t miss an opportunity to watch the sunset over the beautiful San Juan Bay. Visit La Fortaleza, the oldest executive mansion still in use today. It’s found a short distance from El Morro. This magnificent edifice was built in the early 1500s and has been hosting governors ever since. It is also known as the Governor’s House. Explore its beautiful architecture and interesting history on your next trip to San Juan. Other points of interest found in the same area include the old military barracks called El Ballaj and the Cathedral of San Juan Bautista, the cathedral where Spanish explorer Juan Ponce de Leon is buried. Explore the old walls of the city on the Paseo de la Murallas and Paseo de la Princesa walkways. Enjoy the scenic views of the bay on the oceanfront side and the mysteries of the huge walls that protected this town for years. The walkways are 1.5 kilometers long (just under one mile). The shopping in San Juan, Puerto Rico is not to be missed, starting with downtown shopping at old San Juan town and also in the New San Juan town. Shop for handmade Panama hats, jewelry, clothes, and other souvenirs. Purchase all your San Juan souvenirs from Amazon right here. The shopping district begins at the El Mercado in La Placita found a short distance to the left of the cruise pier. From there you can turn right and head up the hill to visit the shopping district downtown. Most of the shopping outlets in the town are found on Calle del Cristo, Calle San Francisco, and Calle Fortaleza streets. Expect to find only authentic, locally made souvenirs in this area, not mass-produced trinkets. Take a culinary tour of Puerto Rico and enjoy the rich, flavorful dishes of the island. Start with lunch in La Placita at Chef Jose Enrique’s restaurant. Enjoy mofongo, the popular fried banana plantain dish made on the island, or have a truly authentic Puerto Rican coffee at cafe Cuatros Sombras. Try the best of Puerto Rican street food at Pinones just right there in the La Placita area. If you are a foodie, Marmalade on Calle Fortaleza is a must visit. El Jibarito in Calle Sol, near Plaza Las Americas, is the place to go for local flavor. Punto de Vista, a rooftop restaurant in Calle Fortaleza, is also another famous eatery to visit. Not only will you enjoy their great food and drinks, but you will also be treated to stunning views of Old San Juan. If you take cruises seeking some sun and sand fun, then you will have a blast in San Juan. There are plenty of beaches in San Juan, but the most popular are Condado, Isla Verde, and ocean park beaches. Head to your right from the cruise pier, in about 15 minutes you will reach downtown San Juan. That’s where all the beaches are at. Do check all of these beach accessories before your cruise to Puerto Rico. Condado Beach is the most popular beach in San Juan. It’s a Miami-style beach lined by high-rise buildings and resort complexes. The beach is found on Ashford Avenue between the bridge and Condado Hilton Plaza. Enjoy a relaxing day here on the long stretch of golden sandy beach with beautiful clear blue waters. There are plenty of palm trees that offer shade on this beach. You can also rent an umbrella and sun lounger for $10 and $5 respectively. In case you get hungry there is a Ben and Jerry’s snacks place or Wafflers near the beach. One thing you should be careful about if planning to swim on this beach are the strong currents. Ocean Park Beach is the tree-lined beach between Condado and Isla Verde beach and is a great beach for all ages. You can sunbathe, swim, people watch or take long walks on this picturesque beach. It’s less touristy than the other two beaches, which makes it great for anyone looking for a less crowded beach. There are some food vendors on the beach selling tasty treats and cold drinks, including beer. Enjoy some tasty empanadas while you relax and enjoy the beach scene. The wind blowing on this beach makes it perfect for kite flying and windsurfing. Sunscreen is a must when visiting one of these beaches in Puerto Rico. Isla Verde is one of the most beautiful beaches in San Juan, Puerto Rico. It features a long stretch of brown sand and crystal clear turquoise waters. It’s a great beach for swimming, boogie boarding, and surfing. The kids can enjoy building castles while you people-watch enjoying cold cocktails or work on your tan. For romantics and anyone looking to walk off some vacation calories, it’s also a great beach for a leisurely stroll. If you find the place crowded, walk further down the beach to get to a less crowded section. You can grab a bite at the El Alambique restaurant on the beach when you get hungry. 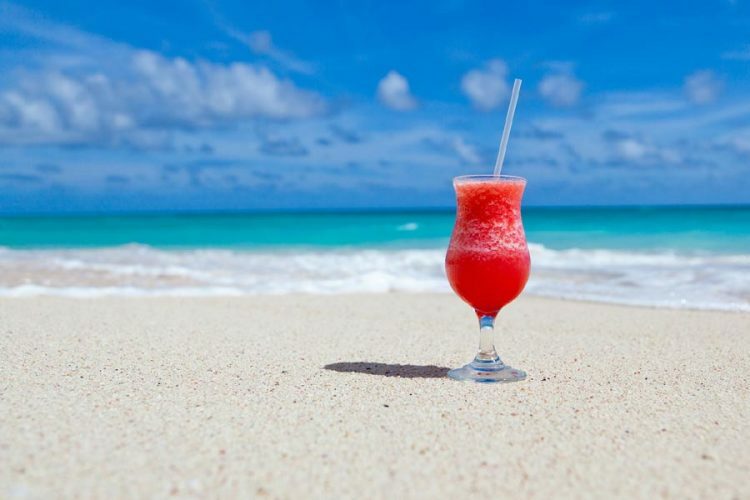 For more casual fare, try the beach vendors who sell great pork tacos, chicken kebabs, and delicious piña coladas for just a couple of dollars. Walgreens is also nearby; you can buy some snacks and bring them to the beach. The price to rent a beach chair is $4, and $10 for an umbrella. Balneario El Escambron is a picturesque beach in San Juan with its soft golden sand and crystal clear turquoise water. It has clear warm shallow waters and is protected by a coral reef offshore. It is located in Puerta de Tierra, in the east side of Old San Juan that connects to the mainland. You can walk to this beach from Old San Juan and Condado. The beach offers plenty of water sports including snorkeling and scuba diving. You can also take long romantic walks as you take in the scenic views. There is a park nearby where you can visit to explore the Puerto Rican flora and fauna. This side of town also features a historic site, the Bateria del Escambron. It was used for shooting practice by the Spanish military. Visit this place to enjoy the beauty and magic of it. El Yunque rainforest, the only rainforest under the national forest registry of the United States, is a must visit on your trip to San Juan. Though it’s not found in the city itself, a quick 45-minute ride will take you to this forest. Explore the rainforest and its jungle-like setup, learn about the different plants, animals, birds, butterflies and more found in this unique habitat. Carry a bathing suit in case you plan to take a dip in one of the many pools in the forest. It features some very beautiful waterfalls, such as La Coca Falls as well as La Mina Falls. There are hiking trails as well, and you can get a local guide to give you a guided tour. However, due to hurricane damage from storms in recent years, some routes within the forest are closed to give room for repair and maintenance. It would be wise to get bug spray if you’re heading to the rainforest. Other than lying on the beach, there are plenty of water sports to be had in San Juan. Enjoy snorkeling and scuba diving, kayaking, banana boat rides, fishing, water flying, and other cool water sports. You will find these sports on all the beaches you visit. Water shoes are a must for most of these activities. Go and check them here. Visit Casa BACARDÍ Puerto Rico found in Cataño and take a guided historical and rum factory tour. You can take a 10-minute ferry ride from Old San Juan to Cataño and get a taxi to Casa Bacardi, the largest Bacardi rum distillery in the world. The factory is found opposite the CVS pharmacy that affords you extra shopping for personal effects. A trip within the factory itself will depend on which excursion you chose. If you want to learn the science behind how rum is made and take a specialty tour, then you should go on the mixology tour. If you just want to learn the history of Bacardi rum, taste some samples, and maybe shop a little, then take the general tour. While on the topic here are some tasty Tortuga Caribbean Rum Cakes which you’ll likely come across during your cruise. San Juan features a tropical monsoon climate. It has an average temperature of 81.0 °F. The winter season has the lowest temperatures averaging at 70.0 °F. The hottest time in the town is from May to September, while the cool season runs from November to March. March is the driest month in the city. Now that you know what you know all the fun and interesting things that you can do in San Juan, it’s time to start planning your trip. 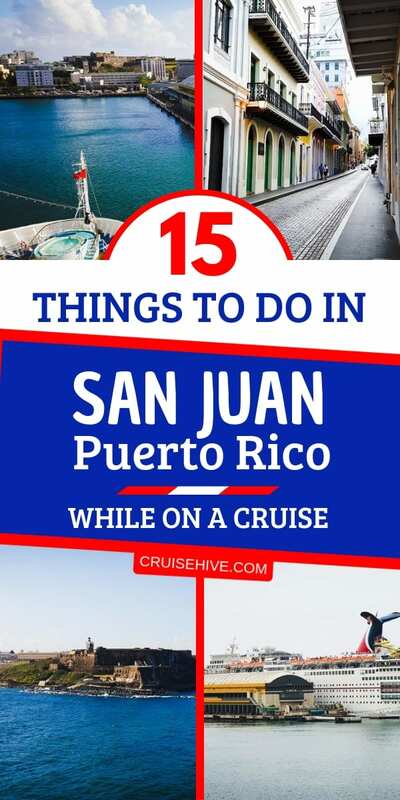 Remember, if your cruise embarks from San Juan, Puerto Rico, you can always arrive a few days early and explore the town and its environment to the fullest, or you can always plan more than one cruise to visit this amazing port and see all it has to offer. Happy Cruising! !